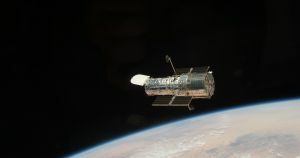 The iconic Hubble Space Telescope has been offline since early this month when one of the gyroscopes it uses to maintain its orientation in space failed. NASA’s engineers could soon bring the telescope back to normal science operations, according to an update from the space agency — but ultimately, the aging Hubble is now on borrowed time. The problem, according to NASA, was that Hubble’s backup gyroscope was returning strange readings. The backup gyro hadn’t been turned on for more than seven years, so NASA hypothesized that it had become blocked and instructed the telescope to make a series of rapid turns to free it up. Since then — knock on wood — the readings have been more accurate, according to the space agency. However heartening the repair may be, Hubble won’t last forever. Experts estimate it’ll be out of commission by the early 2020s, at which point astronomers’ will turn their attention to the James Webb Space Telescope — and as well as whatever new equipment they eventually launch to replace Hubble. More on the Hubble: What Will We Do When Hubble Dies?